I went in a cave today. Those of you who know me are sitting there in either dismay or disbelief. I know. Me too. I am not a caver. 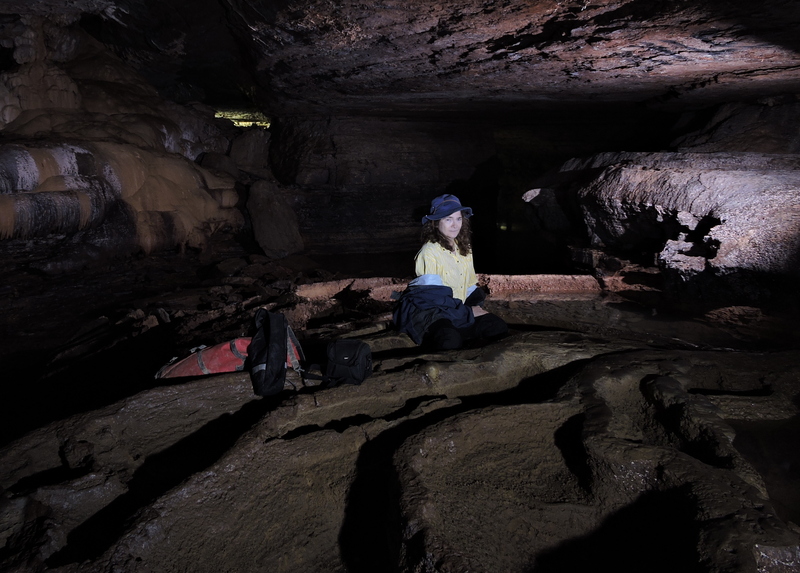 In fact, caves pretty much embody all the things I hate most: cold, dark, wet, and muddy and feeling trapped. And ticks, which weren’t actually in the cave but you have to hike through to get to a cave. Somehow it just seemed really important to my husband that I get to see in real life some of the things he takes those gorgeous photos of. Mark (the aforementioned husband) organized a hike, picnic, cave, hike and then reward ourselves with a nice restaurant kind of day. He made it sound even better by inviting all our (grown) kids along. The whole family decided it was a fab idea. The husband and the younger “child” and I met my older son and daughter-in-law near the cave. We took our sub sandwiches and drinks on a hike (longer and steeper than advertised, of course) to the cave entrance where we spread out our picnic blanket (an old shower curtain) and enjoyed the spot. That part I knew I was going to enjoy. Then, cave time. As a compromise to my claustrophobia and general skepticism, we only went in the “twilight zone,” which is what cavers call the first part of the cave when you can still look back and see the daylight at the entrance. Even if that daylight is just barely bigger than the full moon and you had to stand close to one wall and squint to see it. But I could see it, and knew that in a disaster I could make my way back to the entrance. It kept me from being claustrophobic. Or at least not full on panic claustrophobic. Helmet lights helped it not be so dark, it wasn’t a particularly muddy cave, and there was nothing to do about the hike through the stream but grin and bear it. There really were pretties, not too very far in. Things I’d only seen in photos before. It was cool to get to touch them. Flowstone, rimstone, straws, and bright little gold flecks on the ceiling plus a small fossil or two for a bonus. Of course, I have two new bruises and another gash on my right ankle. I took a tumble into the water before we even really got into the darkness. I was back up pretty quickly with only one side wet and I already knew my pants were going to be wet most of the way up from the wading anyway. Mark had said the water was only knee deep. Yeah, right. Some giant’s knee. However, he was very solicitous (almost overly worried in fact) and helped me not to fall anymore and gave me a dry jacket to wear. That water was cold! Frigid, icy, shocking, nearly heart-stopping cold. However, all in all, it was worth it. Not so much to see the formations (though they were quite lovely) but for how happy it made Mark and how it made him appreciate me more. See that little bit of light in the back? I love this story! Sorry about the gash, but I am so happy you guys had a good time at the cave! Thank you I needed this today to remind I can stand my “it” for the time being. You can face “it” today and any day. Just remember where the light is.